PrimaLuna’s new EVO Series of Tube Electronics will make its North American trade show debut next week at AXPONA, 12-14 April, at the Renaissance Schaumberg Hotel and Convention Center, Schaumberg, IL. PrimaLuna will unveil this innovative new product line in the Inspiration Room, on the main floor. Kevin Deal, President, and Anthony Chiarella, National Sales Manager, will be on hand to demonstrate product and answer questions. It has been nearly a decade since PrimaLuna has introduced an entirely refreshed product line and PrimaLuna fans will find the new EVO series shares the previous line’s DNA. 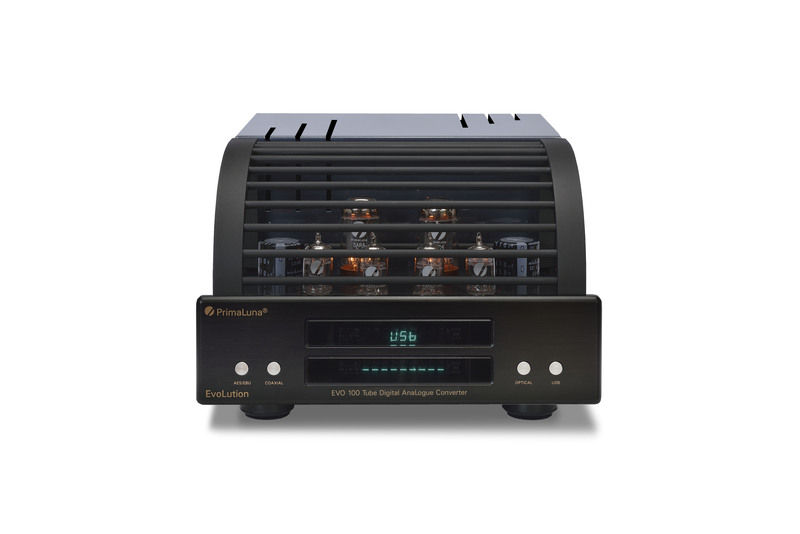 The new products feature upgraded transformers and internal components, improved aesthetics (rounded faceplate edges, Roll-Top tube cages on all models, etc) and an enhanced features set including headphone amplifiers on all integrated amplifiers and true-balanced, transformer-coupled XLR inputs and outputs on upper-end models. Just as importantly is what hasn’t changed, including the metaculous hand-assembly, point-to-point wiring, superlative build quality and cutting-edge Adaptive Auto-Bias (TM) circuitry upon which PrimaLuna has built its reputation. Our super-system will feature PrimaLuna’s first-ever Digital-to-Analog Converter, the EVO 100 DAC ($2,899 MSRP), our Flagship Evo 400 Preamplifier ($4,499 MSRP) and a pair of our EVO 400 Power Amplifiers ($4,699 ea) used as monoblocks. EVO 400 INT and EVO 100 INT Integrated Amplifiers will also be on display. We look forward to welcoming you at AXPONA and showing you the evolution of Tube Electronics! Dit bericht werd geplaatst in PrimaLuna EVO 100 Tube Integrated Amplifier, PrimaLuna EVO 100 Tube Poweramplifier, PrimaLuna EVO 100 Tube Preamplifier, PrimaLuna EVO 200 Tube Integrated Amplifier, PrimaLuna EVO 200 Tube Poweramplifier, PrimaLuna EVO 200 Tube Preamplifier, PrimaLuna EVO 300 Tube Integrated Amplifier, PrimaLuna EVO 300 Tube Poweramplifier, PrimaLuna EVO 300 Tube Preamplifier, PrimaLuna EVO 400 Tube Integrated Amplifier, PrimaLuna EVO 400 Tube Poweramplifier, PrimaLuna EVO 400 Tube Preamplifier, PrimaLuna Tube Amplifier, PrimaLuna Tube Audio en getagged met AXPONA 2019, durob audio, primaluna, PrimaLuna EvoLution Series, PrimaLuna Tube Audio, Upscale Audio. Maak dit favoriet permalink.